Who Else Listens To Your TV? Samsung’s Smart TV listens to everything you say all the time you have voice control enabled. No surprise there. But Samsung’s Terms warn that it’s likely to be sending all that audio to a service provider for analysis, rather than analysing it in your TV. Samsung takes consumer privacy very seriously. In all of our Smart TVs, any data gathering or their use is carried out with utmost transparency and we provide meaningful options for consumers to freely choose or to opt out of a service. We employ industry-standard security safeguards and practices, including data encryption, to secure consumers’ personal information and prevent unauthorized collection or use. I’m sure that is all true. Samsung has a large investment in technical experts of all kinds. All the same, the key phrase there is “prevent unauthorized collection or use”. Why? Well, let’s carry on with their response. Voice recognition, which allows the user to control the TV using voice commands, is a Samsung Smart TV feature, which can be activated or deactivated by the user. Should consumers enable the voice recognition capability, the voice data consists of TV commands, or search sentences, only. Users can easily recognize if the voice recognition feature is activated because a microphone icon appears on the screen. That’s not exactly what the Terms say; they note that “if your spoken words include personal or other sensitive information, that information will be among the data captured and transmitted”. So we’re not just talking about the sort of data Google Now or Siri sends to their service provider (the phrase after you have started the voice recognition). Samsung also sends the commands themselves, plus any conversation around them. From that description, it seems the whole stream of conversation is likely to be sent. Samsung does not sell voice data to third parties. If a consumer consents and uses the voice recognition feature, voice data is provided to a third party during a requested voice command search. At that time, the voice data is sent to a server, which searches for the requested content then returns the desired content to the TV. The fact the data is not sold is good. I would expect no less from Samsung in this circumstance. But there is a use case that is conspicuously excluded from both their statement and the Terms. What about requests for interception? The data may be encrypted to prevent “unauthorised collection or use” but what about authorised use, when a legal authority in one of the countries involved in the transaction requests access to the raw audio? In the USA, the Third Party Doctrine would allow security and law enforcement services to request access without a warrant. Given the service provider appears to be a US company, even if the customer is in a country where interception locally would be illegal, the NSA (or any of a myriad other US organisations) could still collect on their behalf. Tim Cushing thinks this is at least gated by the need for the device ID but I think that overlooks the strategy used by the US & UK security services. They separate bulk data collection and later data analysis, treating only the latter as surveillance in need of a warrant. I would not be at all surprised if Samsung’s service providers at some point get an order to tee all their audio inputs through the NSA, using an order of which Samsung may not even be aware. This would not be for immediate analysis, just for pooling and later use once a device ID is obtained by other means. I asked Samsung to clarify their position on law enforcement use of their streaming audio data, and to clarify whether they had ever received requests for it. So far I’ve had no reply to my questions. I suspect that’s because they have not considered the issue. I think more people need to ask them and their service providers, and their competitors who offer the same services. You say you have nothing to hide? When a joke you made over dinner is flagged by an algorithm and a clipping provided to a busy police analyst out of context leads to a visit by a SWAT team “just in case”, will you still think that? We need this privacy exposure nipped in the bud, given we have police with a SWAT first and don’t apologise later attitude. Some innocent comment caught by a TV is going to lead to a tragedy otherwise. The July Column in the Place de la Bastille in Paris – itself dedicated to the celebration of liberty after the French Revolution – was erected in memory of the fallen of the later July Revolution of 1830. It’s not too far from the offices of Charlie Hebdo. The July Revolution comprised three days of fighting in Paris, primarily on free speech grounds against state censorship. Charles X, France’s last hereditary monarch, had imposed the death penalty for blasphemy against Christianity. He also suspended the liberty of the press and dissolved the newly elected Chamber of Deputies. 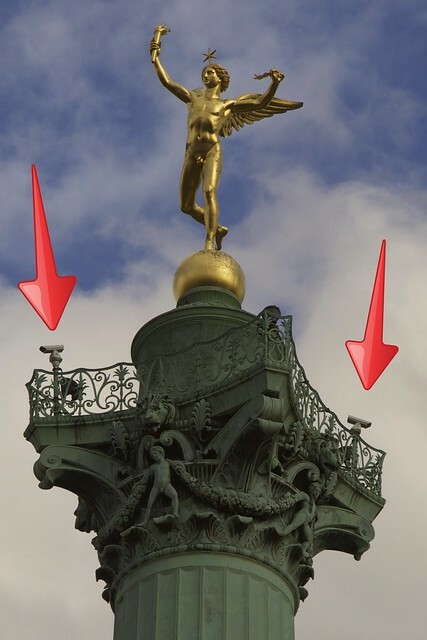 Today, the column is used as a platform for surveillance cameras. We must be on our guard against similar repurposing today. The ever-presumptive and unremittingly faux-positive peer pressure of Facebook is doing its part this Christmas to re-open wounds of hurt from 2014 for a bunch of people. Their Year In Review combines algorithmically-selected photographs and text from Facebook postings throughout the year. It was probably conceived in good faith; they clearly anticipated it would promote thankfulness. I think it will be widely regretted rather than welcomed, for the reasons Eric Meyer explains in the moving post from which my title is adapted. They could definitely have phrased the accompanying text better, not to mention omitted the randomly-selected cover photo – the equivalent Year In Photos at Google+ doesn’t trigger me in the same way, maybe for lack of text. Better, they could have thought through the subject a little more and realised plenty of people, though thankful for so many things, may prefer an algorithm not to force them back through the year. Humans are able to act with discretion, and to know when they are presumptive. Computers are unable to act with any more discretion than their programmer, and usually much less. My own year has had much that I value, but little of it has been shared with Facebook so my own edition is largely valueless. It also thankfully omits the things that make me cry, like the memory of my mother’s passing this spring or the six months of triage following it. If you’ve chosen to share with Facebook, this is a wake-up call that you have also given them the implicit permission to make you relive memories on command. Frankly it’s no worse than the other things you’ve given them permission to do with the intimacies you’ve shared. They are just as free with advertisers and social data miners; you just don’t have that rubbed in your face. If you dislike “Year In Review” you probably will hate the things they do with your data without telling you (even if they have secured your permission in advance through their Terms of Service). In case you were wondering, it’s safe to ignore it; the card displayed on your profile is only visible to you, and as long as you don’t press the “Share” button that appears when you view it, no-one else will see it. You can stop the reminder showing up by clicking the arrow in the top right corner (see below) and telling Facebook not to show the post again. Pity it wasn’t just a button and a “hide this” option for those of us who don’t list Facebook among our confidantes. Algorithms can’t exercise discretion; don’t use them for things that demand it. Is Santa to blame for the surveillance society? Perhaps the reason we are not horrified by the surveillance society is because our parents normalised that behaviour by teaching us about Santa. Filed under: Privacy, Surveillance | Tagged: Christmas |	Comments Off on Is Santa to blame for the surveillance society? Actually, your download is not "free" if to gain access I have to trade my personal details so you can spam me.